Foster Kudjoe Toppar was born in Accra on August 6th, 1990, where he currently lives. 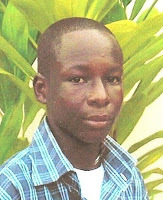 He had his education at Ghanata Secondary School in General Arts, majoring in Literature. He writes poems with the hope to entertain, inspire and comb the lies and the dandruff out of the hairs of our societies. His works and articles have appeared in both print and electronic media. Among them are OGOV, kpokplomaja.com, faithwriters.com and Christian Journal Newspaper. 1. Which came first, the photo or the poem? Did one inspire the other, or did you bring them together after the fact? The photo came first. I was taking photos of some activities on the beach during the recent Christmas holidays which I spent at Ningo Prampram. This boy walked to me and asked me in Damgbe to take a photo of him which I humbly did. The photo greatly inspired me to write the poem. I’ve always wanted to do something like this so I thought it was a great opportunity to do just that after taking the photo. 2. What drew you to utilize this particular rhyme scheme? Is it a set scheme you saw in another poem, or is it improvised? I’ve been doing a lot of reading and studying of both African and Western poetry and what I discover every time I study a poem is overwhelming. So in my comparing and contrasting I came along poems with this rhyme scheme, though I did a little tweaking in the 3rd stanza, as you might have noticed. 3. More specifically, what drew you to change the rhyme scheme in the middle stanza? It makes for a refreshing change. In my quest for originality in my writings I thought it wise to be more creative as any creative writer would want to be. And so after about a year and half or so of studying the poems posted on the site every now and then I decided to improvise this rhyme scheme in the middle stanza. So unlike the usual rhyme pattern of ‘abba’, in the middle stanza I use ‘aabb’. I guess this sum up the reason for my long silence on OGOV. 4. How important are outside editors, critics, etc. to the development of your writing? Editors, critics, etc. have tremendous impact on what we write or even say. They are quite important to the development of my writing career. Many of them are the experts with a wealth of experiences so it’ll only do me good to draw some inspiration and advice from them. On the other hand, if they are not there it should not prevent me from exposing my talent and creative skills. 5. It's been over a year since we last heard from you. Give us an update on your life in the last year! How is life in Adenta? A lot has happened... aside from developing my creative talents, attending book launches, literary nights and poetry readings; I’ve also been doing a lot of religious stuffs like composing songs and ministering in my local church every now and then. I believe poetry and music are like Siamese twins. They are inseparable to some extent. In this case either of them draws inspiration from the other so that neither is left out. We have all prayed this prayer once in our lives and it is a good piece of work. Keep the pen busy because it is our only weapon Foster. Hotep!